The DeltaLine UV series features ‘in-one-line’ positioning of the inlet and outlet connections. The UV lamps are high-output medium-pressure polychromatic types, positioned perpendicularly to the flow. The high-output medium-pressure (MP) UV lamps emit wavelengths between 200 and 400nm. 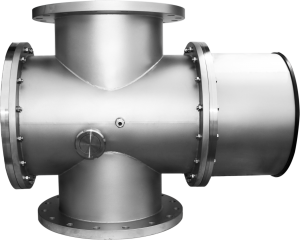 DeltaLine UV systems are typically used in low-transmittance (high-absorbance) water applications, such as wastewater (both communal and industrial) and drain water for greenhouse operations. A motor-driven cleaning device, which prevents fouling and protects the quartz sleeves and UV sensor, is standard with the DeltaLine UV system. The CFD (Computational Fluid Dynamics) designed DeltaLine UV provides optimal protection against waterborne human and plant pathogens, including bacteria, moulds, protozoa and viruses.